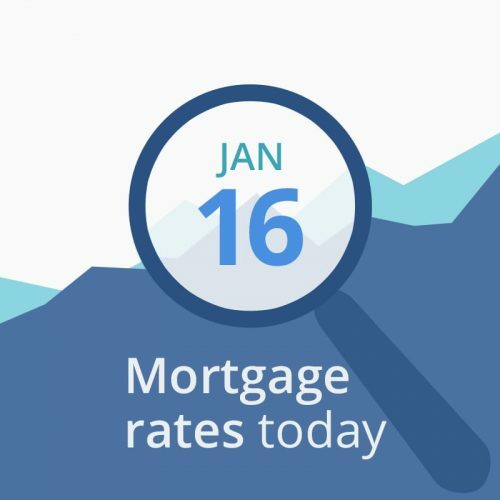 Average mortgage rates today opened slightly higher. We are expecting one of the more important economic reports, December’s Retail Sales (predicted: no change), but it has been delayed. An increase in sales would likely push rates higher, and a decline would indicate economic softening and cause rates to fall. But we’re still waiting for the results and will have to update this post when they come through. For now, we must look at the data below the rate table for clues. Stocks are a big part of today’s increases, with big banks earning major profits and pulling the Dow and other indexes along with them. This morning’s opening data are mostly bad for mortgage rates. CNNMoney’s Fear & Greed Index moved 10 points higher to a reading of 42 (out of a possible 100). That score is in the “fear” range. However, the direction of movement is bad for rates. “Greedy” investors push bond prices down (and interest rates up) as they leave the bond market and move into stocks, while “fearful” investors do the opposite. There is little happening in financial markets right now. You can probably afford to float a day or two if it will get you into a better tier — for example, a 15-day lock usually has a .125 percent lower rate than a 30-day lock. But if today’s reduction got you into your strike zone and you need to close quickly, grab your rate.